The Grand Atrium is at the heart of Iona, a lively focal point that encapsulates the spirit of the ship. Spanning three decks each level of the Grand Atrium offers a different destination for guests but with the same views and natural light. 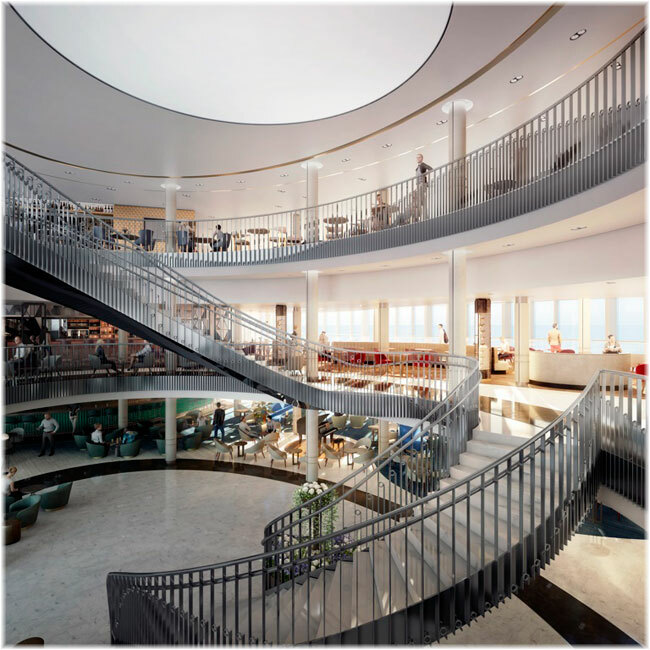 Iona’s glazed Grand Atrium is a new development for P&O Cruises, created by architecture and interior design practice Jestico + Whiles, the creators of W Hotel (London), Aqua Shard (restaurant in the Shard) and The Yas Hotel (Abu Dhabi). A show-stopping staircase will take guests through the open area, designed to complement and reflect the outdoor views. The Grand Atrium is a key entertainment space on board Iona and the sea will provide an ever changing backdrop to a wide variety of experiences. From morning coffee as the sun rises, to evening drinks as it sets, the Grand Atrium will be buzzing with light and life. And as day moves into night there will be a seamless transition as the designers employ the most modern lighting techniques to create a warm and intimate atmosphere. The Grand Atrium will be home to The Glass House (Deck 7). With an impressive wine list and menu curated by award-winning wine expert Olly Smith, wines from around the world are served by the glass. Wine connoisseurs will be well taken care of with a new experience, Cellar Door at the Glass House will offer wine talks, tastings and wine-pairing dinners. Guests can relax with unbeatable views as they watch impromptu aerial and circus performances in the three storey high space. P&O Cruises introduces its first ever ‘gastro pub’ on Deck 8, with views over the Grand Atrium and the ocean. The Keel and Cow is anything but an average pub. The unpretentious venue will be delivering all day dining, with traditional favourites, perfectly aged steaks and sharing platters. Deck 6 of The Grand Atrium brings a choice of places to relax and watch the world go by. At the Vistas Cafe Bar there is a selection of treats from P&O Cruises Food Hero and master pâtissier Eric Lanlard. The nearby Emerald Bar will offer a stylish living-room feel, with premium cocktails and the buzz of a Covent Garden venue. A stunning glass SkyDome will be the crowning glory on top of P&O Cruises ship Iona, providing a new home for on board entertainment, along with a “hidden” night club and boutique cinema. Brand new for P&O Cruises, SkyDome is a contemporary entertainment venue. Located on decks 16 and 17 it promises to be one of Iona’s star attractions, featuring an impressive roof and a pool with retractable stage. SkyDome offers a unique space whatever the weather. By day it is the perfect place for relaxation and informal dining. By night SkyDome comes alive with spectacular aerial performances, immersive shows and deck parties. Above it all is the glazed dome roof designed by award-winning British engineers Eckersley O’Callaghan, the team behind glass masterpieces such as London’s Embassy Gardens Sky Pool and Bulgari’s flagship New York boutique. Music and cocktail lovers will feel immediately at home in the 710 Club, which is being billed as Iona’s ‘secret spot’. With the décor and atmosphere of a Covent Garden nightspot, the 710 Club has a stylish cocktail bar and is designed for live and acoustic music. From classic and modern jazz to swing and Rat Pack covers, guests will enjoy expertly made cocktails whilst relaxing to the sound of top quality performers and special guest stars. Film buffs will love Ocean Studios, another first for P&O Cruises. This boutique cinema boasts comfortable seating in a premium style setting. Four cinema screens will run throughout the day and show a mixture of classics and recent blockbuster with the latest surround sound technology creating a truly premium cinema experience. The Keel and Cow will be a brand new concept for P&O Cruises guests to enjoy, serving perfectly cooked steaks chosen from a glass fronted dry aging fridge and British gastropub dishes. The clean lines of the design will offer incredible views through the three storey high glass walls of the Grand Atrium and will also be open for quick and convenient breakfasts, perfect for guests looking to be first off the ship on a port day. The debut of a new ‘foodie’ market is another exciting development for P&O Cruises. The Quays piazza will be home to a wide range of self-service and “takeaway” venues, with a lively atmosphere for sociable dining. The Quays is set to be a buzzing destination that will offer cuisines from all around the world, from Asian street food to American diner classics. These imaginative new venues join P&O Cruises favourites that are already guaranteed a home on board Iona. Regular guests will be delighted to discover The Glass House with small plates, charcuterie and cheese as well as around 40 wines by the glass chosen by wine expert Olly Smith; the British-Med specialities in Epicurean; contemporary fine dining Indian in Sindhu and the best of British in Brodie’s among a long list of restaurants, self-service choices, cafes and bars. As part of a new approach to dining, Iona will exclusively offer Freedom Dining in all of its main restaurants, a first for P&O Cruises. The move is designed to give more flexibility to each and every guest. They can choose just where and with whom they want to eat, and when they will sit down for breakfast, lunch or dinner.